The final mile can be quite expensive. Just in case you’re not well-versed in supply chain management lingo, the “final mile” refers to the last leg of the delivery process. This is when goods are moved from a regional transportation hub to the customer’s actual location. According to a recent Honeywell report, the final mile is responsible for 50% of delivery expenses. Why does the final mile cost so dang much? Well, a big part of the problem is that many companies haven’t gone digital yet. The final mile can burden businesses with a mountain of paperwork, including travel directions, route schedules, dispatch orders, confirmation slips, invoices, and much more. All that paper piles up. It takes a long time to process. And since you have to pay your employees, that time will cost you a lot of money. Bad routes are another thing that can make the final mile more expensive than it has to be. If your routes take more time to complete than necessary, you’ll delay your drivers and upset your customers. Final mile delivery software solves both of these issues. It takes paper out of the equation, and it ensures that your routes are as efficient as possible. Why do you think market leaders like Amazon and UPS use this tool? It makes it easy to keep your customers happy. With final mile optimization software, you can improve your delivery times, encourage better driver safety habits, and increase your profit margin. Okay, it’s not that complicated if you only have one destination you’re going to. You can jump on Google Maps and look up how to get to the grocery store and back pretty easy. But if you’re running a business that requires your employees to drive around all day, planning routes can get pretty complicated. Google Maps won’t tell you the best way to sort your stops. It just plans your route in the same order that you entered the addresses in. You’ll have to figure out the optimal order yourself. And Google Maps isn’t sophisticated enough to account for all the factors involved with route planning. It’ll show you how to get somewhere, but it can’t guarantee that’s the absolute most efficient way to get somewhere. Final mile delivery software like Route4Me, however, is able to account for everything involved with vehicle route planning. Traffic laws, delivery deadlines, the cost of gas, the cost of labor, construction, weather, tolls: everything. Your drivers will have an easier time staying on schedule, and you’ll spend less money on gas and other expenses. Another advantage to Route4Me is that it comes with a GPS tracking feature. You’ll be able to see where your drivers are at all times, so you can ensure that they’re sticking to their routes and not slacking off. Even when you start with a perfect route, sometimes a last-minute change can throw you off. For example, a customer might call after your drivers have left for the day and ask if you can deliver their package to a different address. If you plan routes manually, this would be very difficult to do. You’d have to look up how to get to the new address, figure out how to adjust the rest the route, and then relay the instructions to your driver over the phone. This confusion will likely mess up the whole route and make your driver late to several different stops. It’s better to just tell the customer that you can’t accommodate their last-minute request in this scenario. But when you use web-based final mile delivery software like Route4Me, accommodating that request is easy. You just have to take out the old address and plug in the new one, and our software will create an adjusted route for you in 30 seconds or less. And all the changes you make to a route on your office computer will be automatically reflected on your driver’s smartphones, so your driver will know exactly what to do without you having to say a single word. See? Easy. If your business involves transporting hazardous materials, then bureaucratic red tape can slow down the final mile process, thus making it more expensive. Of course, it’s a good thing that regulations exist to protect people from being exposed to dangerous chemicals. Recording the status of hazardous materials while it’s being transported is necessary to ensure public safety. Route planning software allows you to fill out much of that paperwork electronically, which’ll save you a lot of time. Such software can also be used to improve safety practices. 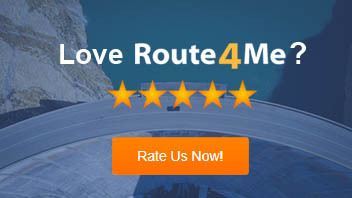 With Route4Me’s route optimization software, you can specify what kind of goods you’re moving. If it’s radioactive material or something like that, our software will plan a route that takes you through less densely populated areas. Final mile delivery optimization software often comes with many other safety-improving features. For example, Route4Me allows you to factor sunrise/sunset times into your routes, so your drivers can get to where they need to go without the sun getting in their eyes and impairing their vision. You can’t bill your customers until their goods have been delivered and signed for. If your employees in the field capture proof of deliveries on paper, it will increase your time-to-cash figure. That’s because you have to wait for the driver to come back to the office at the end of the day before you can process any delivery confirmations. That’s not a problem with final mile delivery software that comes with an eSignature feature like Route4Me. With this feature, customers can sign for deliveries on your drivers’ smartphones. Since this is web-based software, you’ll get these signatures immediately, which means you can start processing the confirmations and collecting your payments immediately. According to Gartner, a commitment to ensuring better customer experience will increase your customer retention rate 25% more than any sales or marketing initiative. Final mile delivery optimization software makes it much easier to keep your customers happy. Optimized routes allow your drivers to arrive on time more often, and customer love it when you get to them when you said you would. Customers can view the delivery vehicle’s current location and ETA on a map. Customers receive an SMS when the driver is close to the delivery location. Customer receive an SMS when the driver arrives at the delivery location. So, do you plan on using final mile delivery software? Do you have any questions or concerns about this technology? Let us know in the comments section below. Nice to read this blog. Now it seems as these delivery apps will surely going to help in achieving last mile delivery goals if used properly. Thanks for sharing the above knowledge.